With all our moving around and packing and unpacking and living in compact spaces, I have lost the desire to accumulate kitchen gadgets. If something cannot be used for three or more different purposes I am hard pressed to acquire or keep it. If I do succumb, such things often don’t make ‘the cut’ when we are packing and downsizing. Things like avocado slicers, cherry pitters, cheese slicers and the like are not found in our kitchen drawers. On the other hand, our eleven year old Wusthof knife set goes with us everywhere. One thing I have not been able to do consistently without a gadget is vegetable ‘noodles’. I can use a vegetable peeler to make strips of veggies (yes, the peeler always makes the cut), but not so much the rounder noodles I want as a base. I caved and finally bought one of those twisty vegetable noodle makers. It works well and is compact (I bought the smaller, non-deluxe version). I have used the noodles under sauces in place of pasta, used them as a side dish, and even as part of tacos and enchiladas, which I must say went especially well. Using the gadget reminds me of peeling oranges as a child – I always tried to peel them in one long strip. This gadget can literally make one long noodle out of a zucchini. The problem with a three foot long noodle is dividing it among diners, so ponder some trimming either before or after cooking. The nice thing about all these uses (and trimming opportunities) is the preparation is the same, and simple. I use them as a conduit to compliment other foods, like many use rice or pasta, so keeping the preparation simple makes so much sense. One way to use them that I have not yet tried is in soup – imagine pho or udon with veggie noodles. Sounds good, but for me, July is not the time for hot soup, so that experimentation will have to wait for fall. 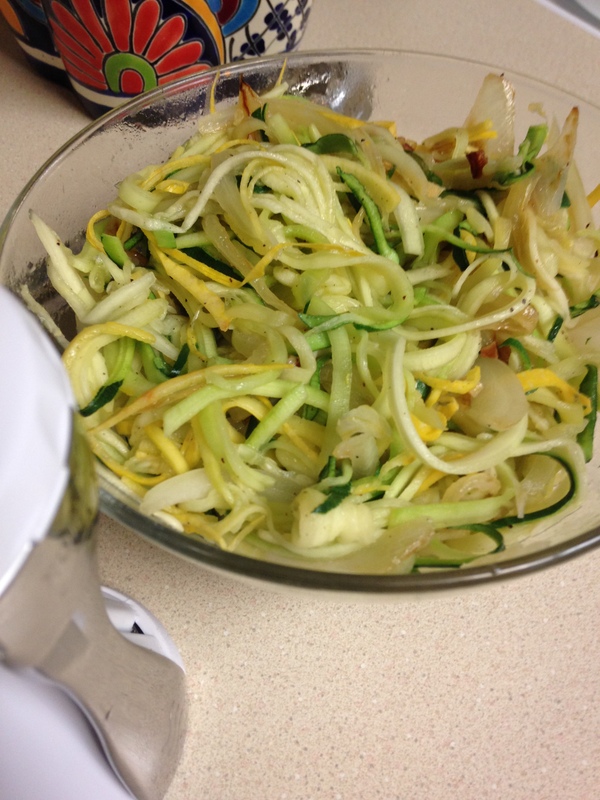 Twist zucchini and yellow squash through thick setting of a vegetable noodle gadget, placing ‘noodles’ into a bowl. With a sharp knife cut an X through the noodles, allowing for randomly shorter, bite-sized strips. In a medium skillet over medium high heat add oil. When oil is hot add garlic and onion. Cook until onion begins to brown on edges. Lower heat to medium. Add squash strips to pan and season with salt and pepper. Toss squash with onion and garlic until heated through, but stop before squash begins to go limp and release liquid, about two minutes. Remove from pan and serve immediately, either as a side dish, taco filler or ‘pasta’ under sauce. Sometimes when we cook over fire pits we are lazy – impaling sausages and hot dogs on sharpened stick and holding them over the flames until they sizzle. It is pleasant, relaxing, and an easy prep – open sausage package, remove sausages, impale. Other times we get a bit more elaborate. Pretty much any meat can be cooked over a pit fire. Same for vegetables, but some veggies are more cooperative than others. I would not try this with greens or other stuff that shrinks substantially, but most vegetables cook up great, anywhere from root vegetables to asparagus and squash. I have also done corn, tomatoes and cabbage. Little B is usually on the side of sausage impaling, because she can be more involved – we are not yet ready to have her reaching in and fiddling with foil packets an inch from hot coals, or leaning over the fire itself to manipulate stuff on a grill grate. Her turn will come in time, but now is not the time. I typically start baking the vegetables an hour or more in advance of cooking meats, so they are ready to serve on time and out of the way. We are sitting around the fire long before eating anyway, so why not let the fire do some work for us? Also, it does not hurt to let the cooked vegetables rest and allow flavors to settle together. Seasoning is simple, because the wood smoke adds an element that does not need much help. Tear aluminum foil into sheets, ensuring they are of a length that will wrap around the vegetables – ideally not to exceed 8×8 inch pouches. Some larger vegetables can be individually or group wrapped, like turnips and corn on the cob. Prepare vegetables in bite-sized pieces, or halved/quartered in equal sized pieces. Place vegetables in the middle of foil sheets in a single layer. Spread butter on vegetables, sprinkle them with salt and place yarrow or parsley on top of the pieces. 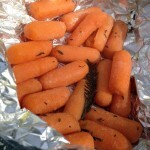 Wrap foil around vegetables, making sure it wraps around twice and roll the foil at seams to prevent leaking. 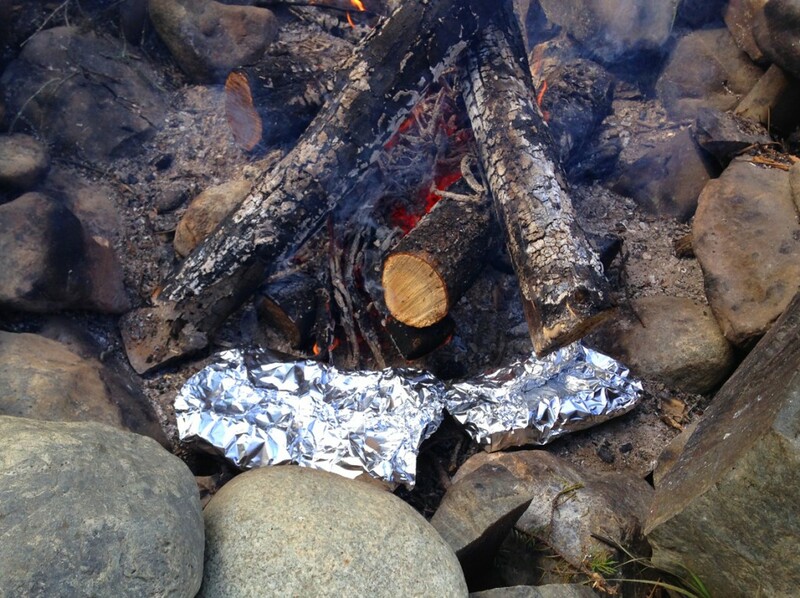 Follow one of these methods: 1) Place packets around the edges of a pit fire. Rotate pouches every 15-20 minutes, changing the side closest to the heat. After 40 – 60 minutes cooking time remove from pit, open pouches and check for doneness. Return to heat if not done. 2) Place pouches on grill grate suspended above fire, flip packets upside down after about 20 minutes, to help even cooking. Check doneness after about 45 minutes, depending on fire size and heat. When cooked to desired doneness, reseal and set aside until time to serve. 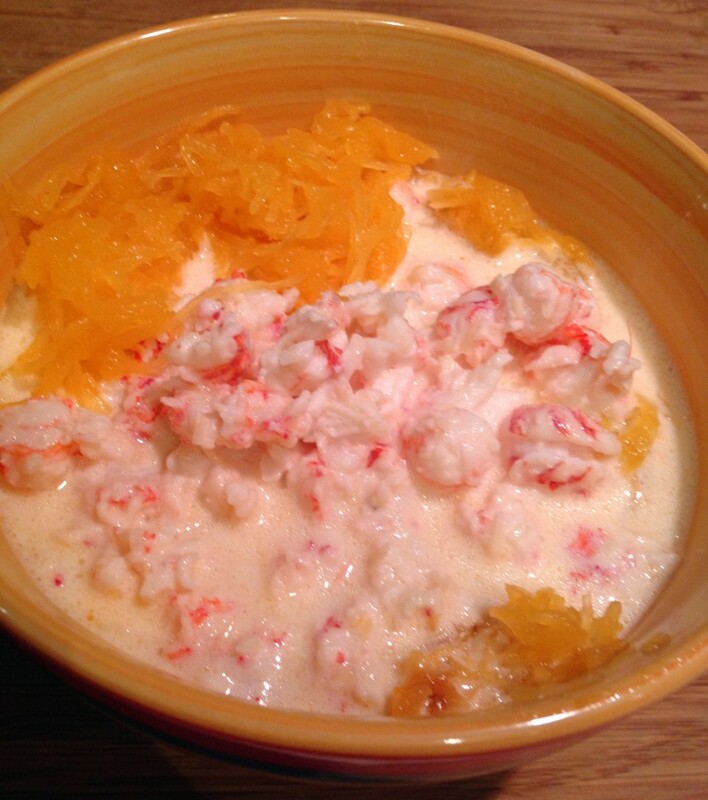 If you had not noticed from the divorce shrimp I made recently, I really like creamy sauces. I love alfredo sauce, although not necessarily on fettuccine, and my favorite pasta dish of all time is spaghetti carbonara. Since I was craving the carbonara and Big D was craving the alfredo, and we were being stared down by the spaghetti squash and shrimp in the fridge, I combined all the pieces into a quiet, Saturday night dinner. Depending on the history you believe, the original alfredo sauce did not actually have any cream, and the original carbonara sauce did not have it either, but I think it all came together in a rich, satisfying dish. I even added a nod to the carbonara’s pancetta with the bacon grease used for the squash and shrimp. Other fats like butter or olive oil or coconut oil could be used, too, but when there is bacon grease available, why? It turned out great and made me want to watch the Godfather or the Untouchables. Salute! Preheat oven to 350 degrees. 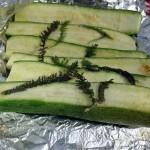 Slice squash lengthwise and scrape out seeds and stringy membrane. Place squash halves face down and place in the oven. Bake for 45 minutes to an hour, until center is soft and edges begin to brown. Remove from oven and let cool enough to handle. With a fork scrape out squash ‘spaghetti’ and place in a bowl. Toss with a sprinkling of salt and 1 Tbsp bacon grease. Set aside until time to serve. While the squash bakes prepare the sauce. In a cold medium sauce pan add the cream and egg yolk. Whisk together until well combined. Add 1/2 cup butter and turn on heat to medium, stirring occasionally. When the butter is melted and sauce begins to steam, but not boil, add the garlic. Continue to stir and avoid boiling. Begin to add the cheese, stirring constantly, about 1/4 cup at a time, making sure it is completely melted before adding more. When all the cheese is incorporated add some salt to taste, if needed. Turn heat down to low simmer and let sauce simmer and thicken, but not boil!!! In a large skillet melt 2 Tbsp bacon grease over medium heat. Add garlic and stir until garlic begins to sweat. Increase heat under burner to medium high. Add shrimp, sprinkle lightly with salt and toss regularly until shrimp begins to turn pink. Sprinkle with parsley and continue tossing until shrimp is cooked through, about three to five minutes. 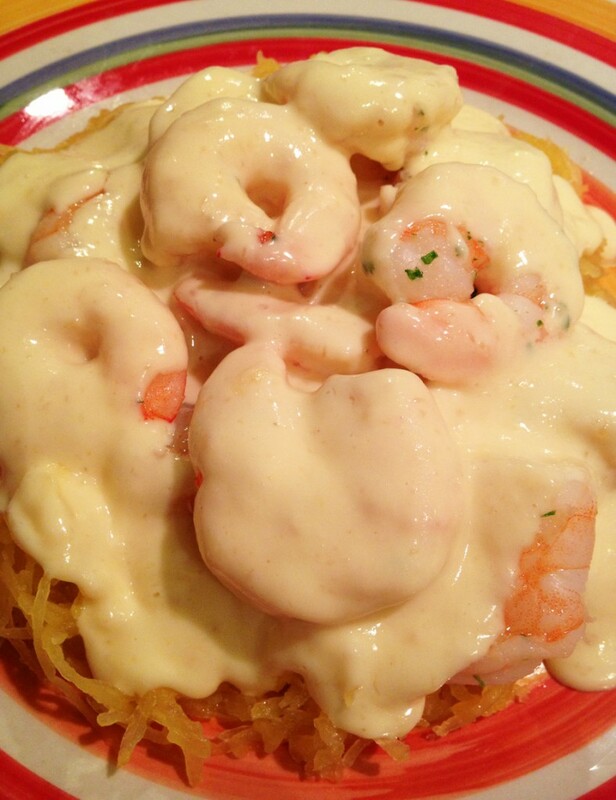 To serve, place a bed of spaghetti squash on a plate, top with shrimp and drizzle with sauce. Serve immediately with parmesean cheese on the side. There is a story/urban legend known down in Texas about a restaurant called Paesano’s. It was (and still is) popular for a Texas version of Italian, including a particular shrimp dish. The shrimp is butterflied and gently dragged through flour and lightly cooked in softly boiling oil. A creamy lemon sauce is made and poured over the top. Totally addictive. I don’t know how true the story is, but here is what I heard many years ago. The married couple who owned the restaurant got divorced. Rumor has it the husband got the restaurant, but the wife got the recipes. It was not enough to have the recipes, so to even the score she widely distributed them and they gradually crept into kitchens far and wide. Eventually I got a fuzzy copy of the recipe titled ‘shrimp paesano’. I have made it many times, laden with flour and served on top of linguine or angel hair pasta. Each time I made it the kitchen is left fragrant and an absolute mess – multiple pots and pans dirty, the counter sprinkled with shrimp shells and flour, but some beautifully presented shrimp resting on a pile of creamy, lemony pasta with sauce. I think I usually remember the mess in the kitchen because you serve immediately and don’t do the final clean up until much later, after food coma passes. I prefer cleaning as I go, then have little to do after dinner. For this recipe you need to drop everything right when the shrimp is ready and sit down and eat. Of course, the dishes are always waiting when dinner is through, just a little stickier than I prefer. Since the restaurant is nowhere near where we live now, and quite pricy when within reach, I can do nothing but make it myself. Here is my attempt to make a version more in line with our less expensive, wheat free, low carb eating habits. The kitchen still is a mess when all is said and done, but the flavor shines through just like the original. I may do a ‘breaded’ shellfish version in the future, but for now the two pot version below really hit the spot on a staying in, snowy Saturday night! Preheat oven to 400 degrees. 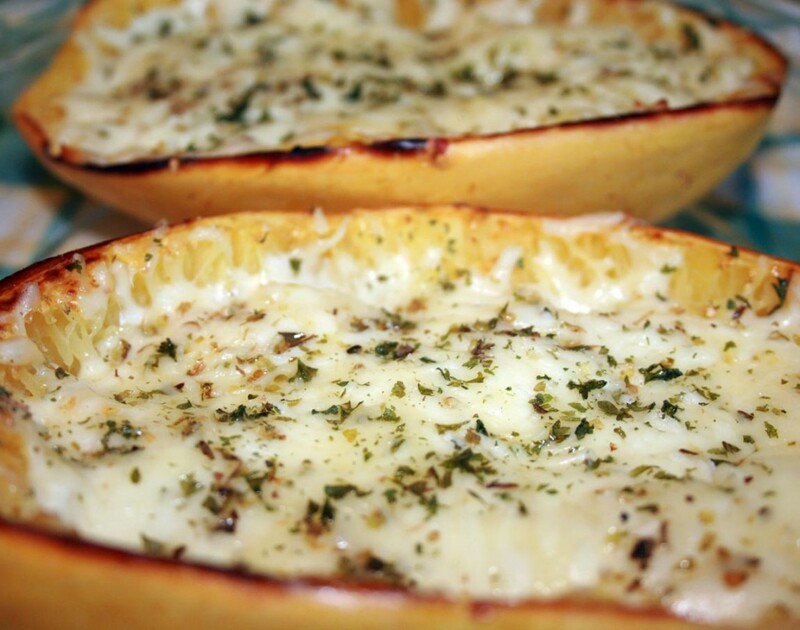 Cut spaghetti squash in half and scrape out seeds. Place halves face down on baking sheet. Place in oven and bake for about 45 minutes, until meat is soft. Scrape out meat with a fork to make spaghetti ‘noodles’. Melt 2 Tbsp butter into noodles and sprinkle lightly with salt. Cover and keep warm until time to serve. While the squash cooks prepare the sauce and prep the shrimp or langoustines. In a large skillet over medium heat melt 2 Tbsp butter. Add shellfish and gently toss, only cooking long enough so they shellfish is only half cooked – the rest of the cooking will happen later when simmering in the sauce. Set aside the shellfish and make the sauce. In medium sauce pan over medium heat melt ¾ cup butter. Add all the lemon juice and garlic. Heat until steamy. Add cream, lower heat and cook until sauce is mixed well, stirring frequently. Add cheese and stir slowly, making sure it melts and blends in with the smooth sauch. Add arrowroot powder and whisk. Sauce should bubble and thicken, but not boil. Add shellfish and gently simmer for about five more minutes, allowing the shellfish to cook through completely. Remove from heat and keep covered. On individual serving plates make a bed of spaghetti squash, then generously drizzle a ladle full of shellfish and sauce. Serve immediately. This stuff is just plain cute. Besides being yummy, serving it in the squash skin makes it fun to eat! I remember when I first had spaghetti squash. My mom served it under spaghetti sauce and said it was just like pasta. That caused the problem – unintended, but problematic. I expected some slight mushiness that started to soak up the sauce. What I got was slightly crunchy strings that mixed with the sauce, but did not absorb. I did not find it appealing after the first encounter. Flash forward a few years. I tried spaghetti squash again, with the expectation of squash, not pasta. It tasted lovely, absorbing the garlic and herbs tossed with it, instead of futilely attempting to soak up marinara. Now that I think back at the two experiences it reminds me to be realistic with Little B when she is trying something new. We often introduce new foods to Little B that may look like other stuff she has had, but will feel and taste different. For example, when you eat regular or instant pudding, then are given chocolate chia pudding, you will have different experiences. They both taste good, but the texture is very different, not to mention the expansive difference in nutritional value. Honestly, I sometimes generalize and refer to most meats as ‘roast’, because she likes roast and it is easier. When it is truly something new I try to describe it for her so she is more willing to not spit it out. When she likes something new she really likes it, but as she gets older she is actually less inclined the try something new. I think it is because of her natural desire right now to display her independence more than not wanting to try something new. I hope it is temporary because she likes spaghetti squash and it is so much better for her than pasta. My ultimate goal is to have new experiences be positive for her. Not always fun or ideal, but result in some learning experience that will move her forward, for the world is full of new experiences. There will be many more new food experiences in her life and I want her to jump into them feet, or mouth first with passion. I know it has made a world of difference for me! Preheat oven to 375 degrees. Cut squash in half lengthwise and remove seeds. Drizzle olive oil on the halves and use your hands to spread it all over the exposed meat of the squash. Place halves face down on baking sheet. Bake for 30 – 45 minutes until inside of squash is soft, but not mushy. Reduce oven temperature to 350 degrees. Flip over squash halves, carefully hold the hot squash with a mitt or towel. Using a fork, scrape the squash meat off the skin, but leave it in the shell. Sprinkle the squash with salt and garlic powder, then gently toss the meat within the skin. Sprinkle with a little more salt. Divide mozzarella on each half, followed by the oregano and parsley. Finish with sprinkling the Parmesan cheese on top. Return squash to oven on baking sheet, cheese side up. Bake for 15 – 20 minutes, until cheese is melted and beginning to brown. Remove from oven and serve immediately – small squash can result in an entire half being a side dish, while larger squash may need to be cut into quarters for serving. I bought a big, beautiful acorn squash a week or two ago. We have leftovers from the holidays filling the refrigerator and freezer, so in the process of figuring out what to do with the squash, I realized we were running low on goodies for Little B. Additionally, she was to begin a new preschool soon and we needed to stock up on portable wheat free snacks for her. And on top of THAT, I got an awesome new mini loaf plan as a gift and was itching to break it in. To make a bread that has some sweet and savory I included nuts and spices. Of course, relying on coconut flour and eggs to beef up the protein was a must. Little B likes this stuff a lot, and this particular squash was sweet, so the squash/snack/loaf pan goals were met with one recipe. Three birds, one stone. Big D bit into it and groaned – in a good way – it reminded him of his grandmother’s banana bread, and it had no bananas. Now THAT is a compliment! Preheat oven to 350 degrees. In blender combine squash, walnuts, eggs, oil and vanilla. Blend until smooth and nuts are broken up to around the size of little peas. In mixing bowl combine flour, meal, erythritol, salt, baking soda, baking powder, cinnamon and nutmeg. Add blended ingredients to dry ingredients and stir until well mixed. Pour batter into greased bread pan or mini loaf pan(s). Bake for 40 – 50 minutes if making one large loaf, or 25 – 30 minutes for mini loaves. The bread is done when the loaves look set (no longer liquid) and the edges begin to brown. Let cool in the pan before removing. Breads made with coconut flour need to cool before they are set enough to remove from pans, but making sure the pans are greased well make the removal process easier. 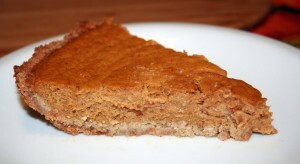 A pumpkin pie with a crispy crust and moist custard, full of spices and sweet pumpkin. A quintessential dessert around my house during the holidays. We like serving it chilled, and mine is usually topped with some freshly whipped cream. I like making it first thing in the morning so the house smells wonderful all day. Little B is becoming quite a pro at stirring, so the custard was a joint effort this year. Sometimes I use fresh pumpkin, other times I resort to canned stuff. I have discovered over the years that the fresh stuff needs a little more spicing to get that just right balance of flavors in the pie. Big D likes his pumpkin pie extra spicy and wheat free, while I want it sugar free with a flaky crust. This recipe met all four requirements! My next wheat free, sugar free pie will be pecan. Stay tuned! Heat oven to 375ºF. For the crust, mix together the almond flour, 1 tsp splenda and butter until combined. Press mixture into an 8” or 9” pie plate and refrigerate for at least 30 minutes. In a medium bowl whisk pumpkin purée, splenda, cinnamon, ginger, cloves, and salt to combine. Mix in eggs, one at a time. Add heavy cream and mix well. Pour custard into pie crust. Cover crust edge with aluminum foil. Bake for about 40 minutes, or until filling is set but still a little jiggly in the middle. Cool on a wire rack. Preheat oven to 400F. Divide the butter among the squash halves and spread it around inside each (using your fingers is the easiest way, of course). Sprinkle each half with salt, pepper, garlic powder and onion powder. In a large glass baking dish place the four squash halves. Bake for about 30 minutes, until soft and beginning to brown. Remove squash from oven and lower oven temperature to 350F. Fill each squash half with a layer of spinach, followed by ¼ of the ham. Press the ham down firmly to remove any extra bulk from the spinach. 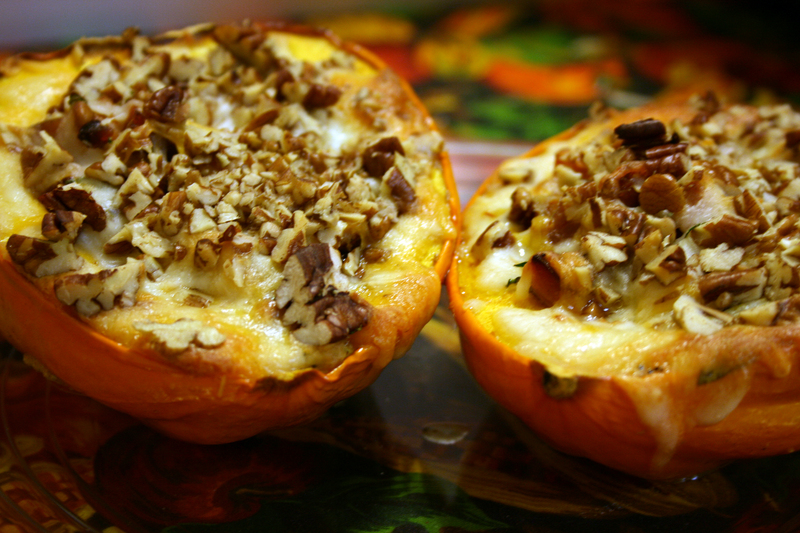 Top with a mix of the cheeses and sprinkle with pecans. Bake for about 20 minutes, until heated through and cheese begins to brown. Remove from oven and let cool for about five minutes before serving. 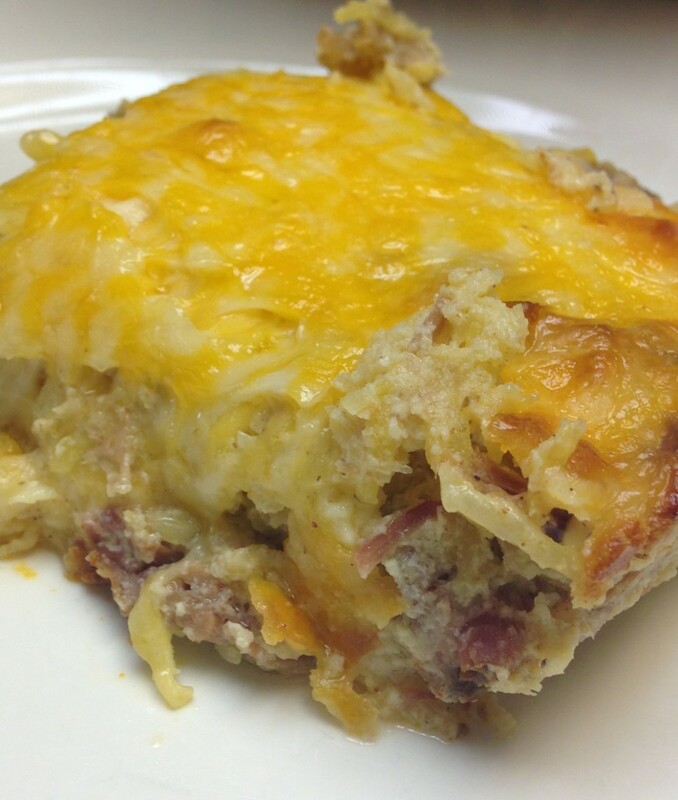 *This recipe is a great way to use leftover meat, so feel free to substitute the ham for diced chicken, ground beef, pork roast or beef roast. If you don’t use ham, which is typically salty, you may want to consider sprinkling some salt on the meat before adding the cheese and pecans.